But my clients don´t speak (nor read) english. I would like to translate that window. So, how can I use this (hidden) function? Presently our cart is only available with labels in English. 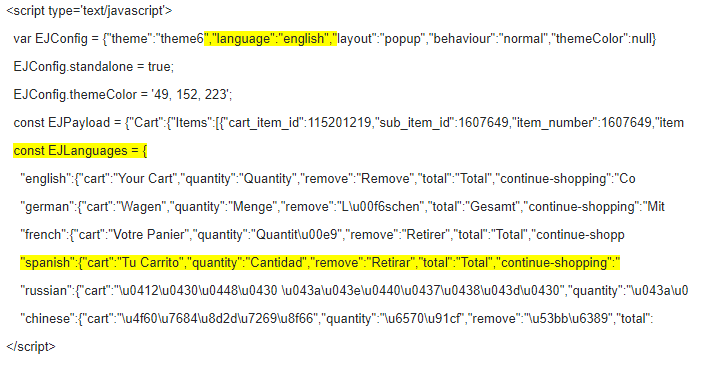 An early beta version of our latest cart update had experimental language localization, looks like what you found in the code may be leftover from that. I'm not sure if there's any way to use it now, but we are planning to add support for customizing the text in the cart soon. Good news! We now support customization of the accent-color and text in our cart. You can find this in Seller Admin under Manage Cart & Shop > Cart Preferences.